Retailer, brand and customer awareness underpins all that Three Point do. These three values converge and combine to form our unique business model. They are always present, yet not necessarily visible. The concept of understanding and giving equal consideration to the retailer, the brand and the customer is vital to the way we approach every project. 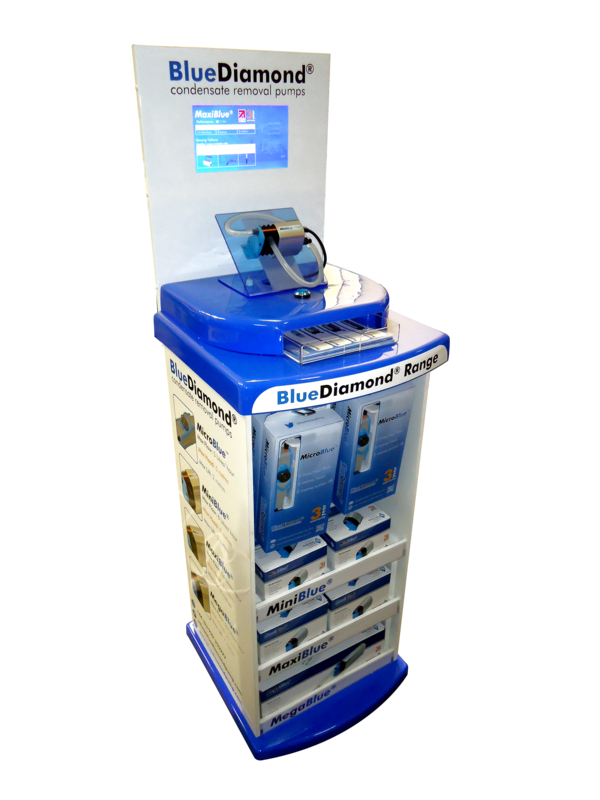 Charles Austin approached Three Point to design and build podiums to both stock, and demonstrate their range of Blue Diamond condensation removal pumps. Light weight, durable podium bases were developed with flexible shelving and hooks to stock different products from the Blue Diamond Range. The topper incorporated a fully functioning pump which is activated by customers via an illuminated button. The working pumps were mounted on to an interchange transparent support, rising to a branded header complete with digital screen. During Freshers’ Week, Coca Cola have a road show that travels to selected universities across the country promoting their products. During this time, students purchasing Coca Cola products are given the opportunity to win assorted prizes. Three Point developed roulette style illuminated ‘spin the bottle’ tables which encouraged students to make purchases and then take part in a game experience. 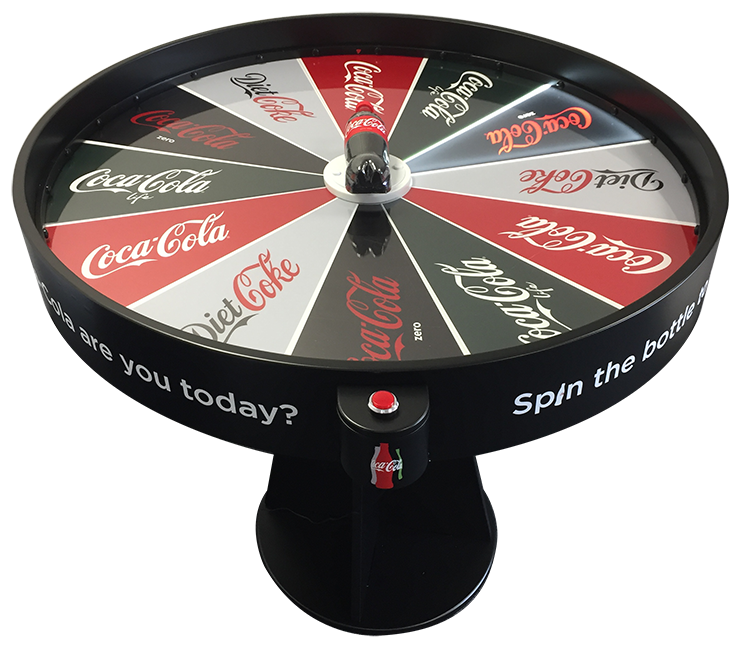 By pressing the illuminated button, the motorised Coca Cola bottle spins and lands on a random flavour segment to win a certain prize. Each segment illuminates in sequence with the spinning bottle and incorporates sound to give an extra dimension to the student’s experience. Each table was supplemented with branded pull up banners and large branded back drop. Tailored foam lined carry bags were produced for all display items, including the spinning bottle tables, to allow safe movement throughout the Fresher’s Weeks Roadshow period. 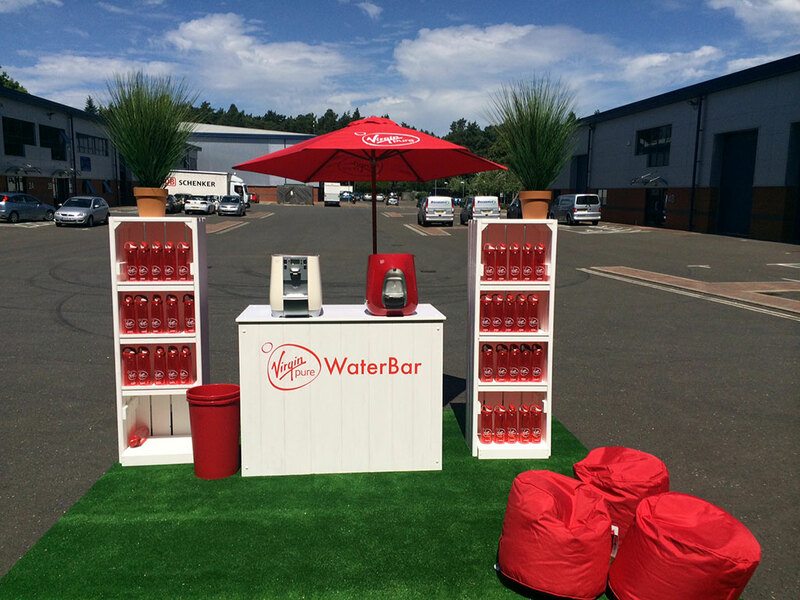 Having previously worked with Virgin Pure producing water tower stations, Three Point were approached to design and produce mobile experience areas to be used at events and shopping malls across the country. Lightweight branded counters and canopies were constructed to sit alongside branded storage towers, tables, chairs, bean bags and parasols. Score boards were also produced to entice shoppers into taking part in a taste test. Finally, artificial grass was used to compliment the al fresco styling and feel. Point of sale was produced by Three Point to support a campaign to expand the potential whisky customer base in-store. 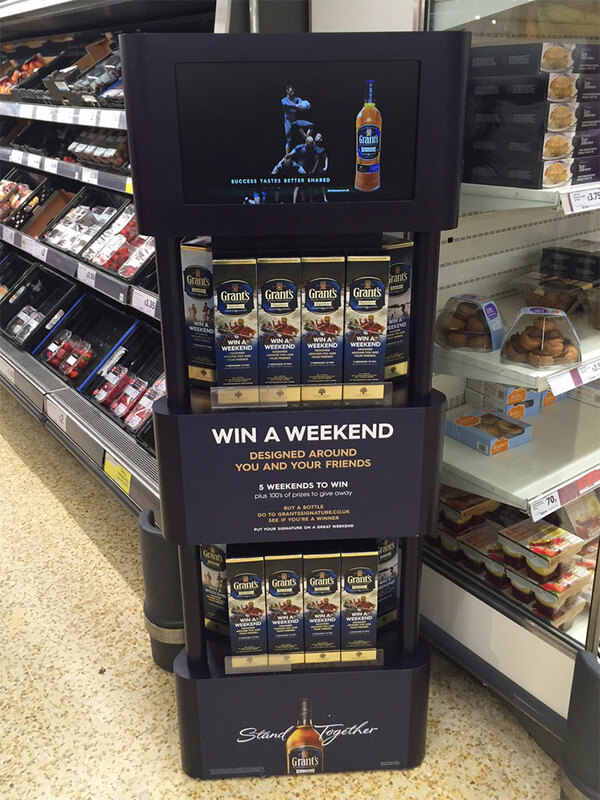 Premium floor stands were constructed in wood and included video to help drive Fathers Day sales and space was negotiated with selected Tesco and Sainsbury’s stores. Three Point manufactured, installed, and managed continuous store communication and collection for re-use to achieve maximum impact and exposure for the brand over the promotional period. Promotional card floor stands were also produced for wider siting of on pack offers. 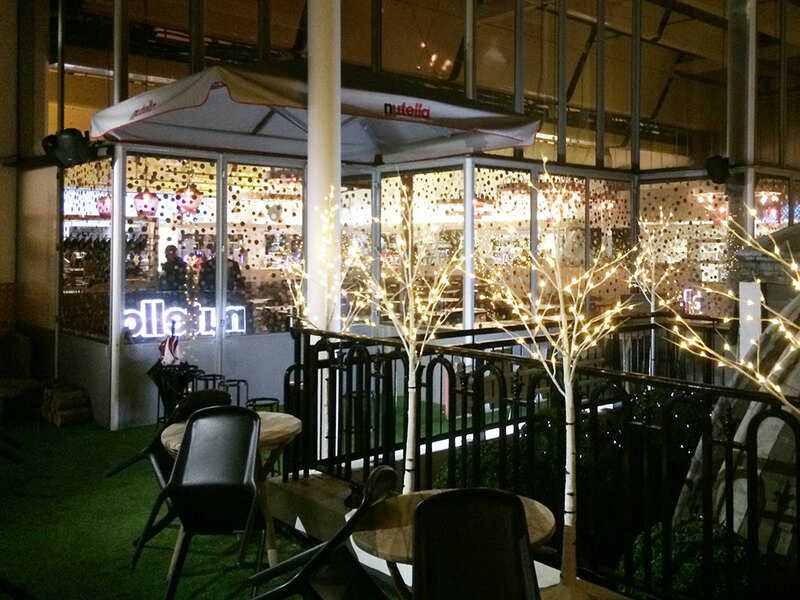 Harvey Nichols terrace café was transformed into an alpine themed area complete with Ski Lodge Kitchen offering hot ‘Nutella inspired’ food. Décor also included floor and wall decorations, and an abundance of illumination and soft furnishings to make the outdoor space appealing and cosy throughout trading hours, despite the early winter sunsets. Three Point not only designed and developed the whole area, but also manufactured all of the bespoke furniture, as well as producing all props and lighting. Electricians, project management and carpenters made up a 7 strong team, working tirelessly through the night, in freezing temperatures, to complete the area in time for Harvey Nichols store opening.